New that you have your brand spanking new iPad, pehaps you would like to tart up your shiny new iOS tablet with a little steampunk jacket that offers a very nice looking wooden case along with a steampunk inspired keyboard, and this particular new iPad accessory is called the iCog Hades for the Apple iPad 3, or new iPad if you prefer. According to the guys over at Ubergizmo, the iCog Hades case for the new iPad features a case that is made of hand rubbed English walnut finish,along with pressure gauges and temperature gauges, although probably not working and just for decoration. The keyboard connects over Bluetooth to the new iPad and features keys with solid brass bezels and an off-white background, although apparently the iCog Hades case is a tad on the heavy side, but does feature a spring loaded trapdoor for easy insertion and removal of your new iPad. Unfortunately thought when using the iCog Hades case the rear camera of the new iPad is blocked, along with mute and lock buttons, and the case needs a couple of AAA batteries in order to operate. Furthermore apparently the maker of the iCog Hased does warm that you might experience some data network reception problems due to all the cooper, brass and steel used in the design. 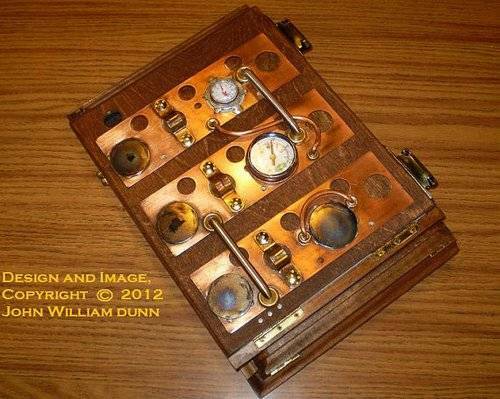 However if you are into steampunk style designs for your iOS devices and would like to purchase the iCog Hades case for the new iPad, you can pick up the case from Etsy at a cost of $424, roughly Â£274.77, and just in case you are wondering, this version of the iCog Hades will not fit the Apple iPad 2.